Testing this useless adware lead us to discover that it is practically identical to Enhance Pro, which has also hit the web only recently. Although this infection has a promotional webpage (tools-plus.apps-repo.net/us/install) where you are supposed to be able to directly add this tool to your Chrome browser, interestingly enough, when you click on the "Add to Chrome" button, the cancellation window pops up and asks you: "Are you sure you wanted to cancel the installation?" Obviously, this window normally comes up when you actually abort the installation process. This is rather suspicious behavior and we cannot speak differently regarding the Chrome web store page, chrome.google.com/webstore/detail/lmllgljchiihefphjbibfkhfogmlbgem, where you get a 404 error page, which simply means that the URL you requested to see does not exist anymore. Without doubt, this means that there is no way for you to install this tool officially, which is generally enough for any security-minded user to want to delete Tools Plus right away. That leaves us with the question then: "How is it possible that users get infected with this adware at all?" Well, the answer is quite simple. This adware may be found spreading in freeware bundles. It is also possible that you install it when you are offered to do so on websites like shopmania.ro. The truth is that this infection similarly to other adware threats starts with a click on the wrong third-party content. The problem with this is that, as we have mentioned, you may drop a whole package of malware threats onto your system. You may be exposed to such content in a number of ways. For instance, your PC may be infected with adware and this infection may display unsafe ads that you click on while surfing the web. A lot of users also get infected while searching the web for free files to download and ending up on questionable file-sharing websites they do not know. These pages usually host malicious bundles instead of standalone installers as well as unreliable third-party ads that can pose as fake download buttons and system notifications. This is why you should delete Tools Plus and make sure to detect all other malware threats by using a reliable online scanner. This useless application claims it can show you great offers and coupons when you go shopping online; however, we have found that it may only annoy you with its distracting pop-up windows and put your system at risk by introducing you to questionable third-party ads. You should never trust a tool that presents to you third-party content and does not take responsibility for them. This should be interpreted as a sign that you might end up on malicious websites or drop infections if you happened to engage with the ads this extension shows you. Of course, this is always a risk whenever you are introduced to third-party ads; even more so when your computer is infected with adware. You should refrain from clicking on random ads because they could be traps. For example, this adware may collect information about you and thus display seemingly relevant ads for you. This is how you may find before long ads that advertise products of your interest at a low price while you are browsing. 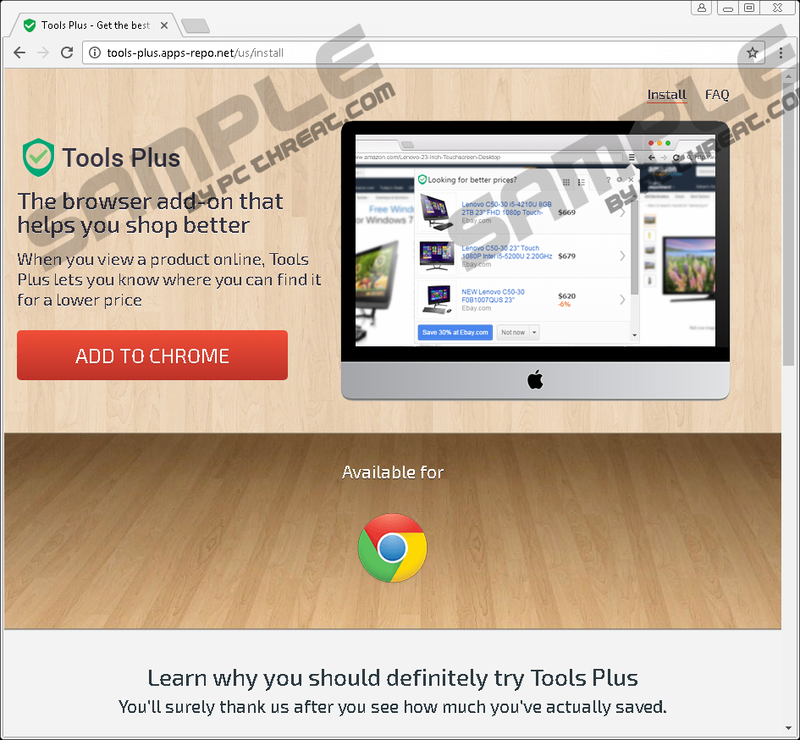 However, when you click, you may open malicious pages on new tabs or in new browser windows, including fake online shops. If you fall for such a trick, you could share your banking information with the criminals that operate these sites and lose money. If you would like to avoid such a nightmare, we suggest that you remove Tools Plus from your browser right now. 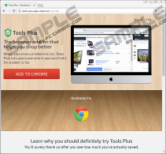 Since this adware infection only affects your Google Chrome browser, the elimination process is rather fast and simple. You can easily remove this extension through your browser settings. If you have never done this before, you can use our instructions below. It would be a mistake to think that after this your system will be all safe and clean. If you want to make sure that your virtual world is secure, we advise you to install a proper anti-malware application like SpyHunter. If you do not do so, you need to be more careful with choosing the websites you visit and use for downloading software as well as with your clicks. But an automated solution can also help you against becoming paranoid about your security. Open the menu by pressing Alt+F. Locate the undesirable extension and click on the trash can icon. Quick & tested solution for Tools Plus removal.